The Spanish Steps is a very wide open air staircase in the heart of Rome. The stairs connect the downtown area around the square „Piazza di Spagna“ with the church „Santa Trinita dei Monti“ above the stairs. The Spanish Staircase is best known as a meeting place for young travellers. In good weather, hundreds of mostly young people sit on the stairs. They party together until late at night. You get to know many nice people. 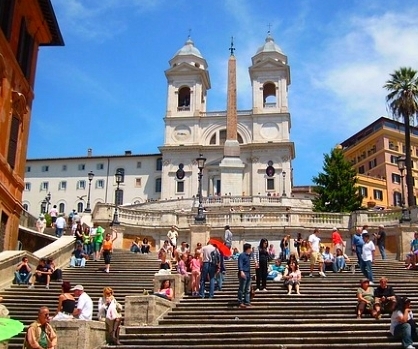 Especially among young tourists from all over the world the Spanish Steps are very popular. History Spanish Steps: The stairs were built between 1723 and 1725. The aim was to create a beautiful connection between church and town. It was a great success. Possibly the Spanish Steps in Rome are today the most famous staircase in the world. The staircase is a public path and of course there is no entrance fee or opening hours. Another attraction is the beautiful fountain Fontana della Barcaccia in the Piazza di Spagna (translated: Square of Spain) below the stairs. Not far above the Spanish Steps is the large Villa Borghese Park, one of the most beautiful parks in the city of Rome. In the park is the very famous Museum of Art Galleria Borghese. The Italian name for the staircase is quite complicated for english speaking people: Scalinata di Trinita dei Monti. But the name of the Spanish Steps in English is all the simpler: Spanish Steps. The building in the heart of Rome is mentioned in the song „When I Paint My Masterpiece“ by Bob Dylan. The staircase was much more of a meeting point for travellers and globetrotters decades ago than it is today. The famous Via dei Condotti starts at Piazza di Spagna with many luxury shops. A stroll through the famous shopping street of Rome is worthwhile. In Via dei Condotti you can see shops of Giorgio Armani, Prada, Dolce&Gabbana, Gucci and many more. Selfies are more popular on the Spanish Steps in Rome than anywhere else in the city. Many tourists upload their photos to Facebook with their smart phones and show their friends at home where they are.